Having lived in the city of light for many years now, I’ve become immune to the general attitude of Parisians so it comes as a surprise when people act differently outside the capital. We were in Blois for a few days last week and had three encounters that reinforced our decision to move there in three years time. It was Monday and most places were closed. We had lunch then set out to find a cybercafé to continue our house hunting. Every address on my iPhone turned out to be closed. A chef was smoking a cigarette outside a little restaurant called Au Coin d’Table so Relationnel tipped his Akubra and asked whether he knew of an internet café that was open. “No, I’m not from here, I’m sorry. I’ll ask the boss”. The boss came out and he repeated the question. “No worries (well, he didn’t quite say that because he was talking French), I have a computer behind the counter. Come in and use it.” Relationnal explained that we needed to do some research that could take a bit of time. “No problem. I’ll bring my laptop down. Is a Mac OK ?”. So he set us up and the waitress brought us a coffee each. I heard her talking to the last straggler and saying they usually closed around 3 pm, so we wound up our search and turned off the Mac. Then we thanked the boss and asked how much we owed. “Nothing. You only had a coffee.” We protested, but he said, “I’m from the North”. (Northerners in France are reputed as being more friendly and it’s true. You’ll remember I’m a northerner too). So Relationnel gave the waitress a 5-euro note and off we went to find a real estate agent open. And then we really scored! 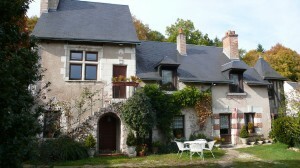 Our first viewing was a beautiful stone renaissance house built in 1584. A little bigger than we intended, a little more expensive than we had budgeted for, a little bit early (by 2 ½ years!) but it was love at first sight for both of us. Perfectly located, wonderfully restored, with a little house next to it just waiting to be renovated for use as a gîte and for friends and family. There’s even wisteria and a holly bush with red berries. Later on, completely subjugated by the house, we parked in the middle of the city and I was going over to get a ticket from the parking meter. A lady pulled up next to us and explained that we didn’t have to pay because we were in a special “20 minute” zone. All we needed was a “blue disk”. She told us we could get the disk from the police station. She insisted that we didn’t need and ticket and could just leave a note with the time of arrival on the windscreen. As we were walking along, we saw two mounted policewomen (mounted on bikes that is) so we asked where the police station was so we could get a blue disk. “It just so happens I have one in my saddle bag.” So now, we are all set to go. Free 20 minute parking in Blois. 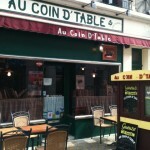 Next time we’re there, we’ll definitely be eating at “Au Coin d’Table”! 12 to 2.30 and 7 pm to 11 pm. Closed Tuesday and Wednesday. 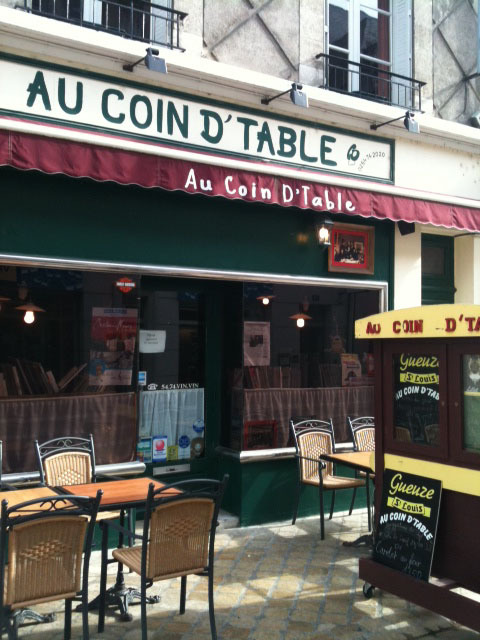 This entry was posted in Loire Valley, Restaurants and tagged Au Coin d'Table, Blois, cybercafé. Bookmark the permalink. I loved this post – I worked in Blois for a year as an assistante 40 years ago and fell in love with the town for much the same reasons as you, it’s so good to hear it’s still much the same! I also realise we lodged initially with the mother of the town’s auctioneer – again, nice to see the tradition’s still being carried on! What a wonderful place to be an assistante! We’re in Blois at the moment and I have more great stories to tell when we get back.